Textile imagery is pervasive in classical literature. An awareness of the craft and technology of weaving and spinning, of the production and consumption of clothing items, and of the social and religious significance of garments is key to the appreciation of how textile and cloth metaphors work as literary devices, their suitability to conceptualise human activities and represent cosmic realities, and their potential to evoke symbolic associations and generic expectations. 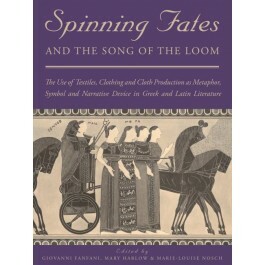 Spanning mainly Greek and Latin poetic genres, yet encompassing comparative evidence from other Indo-European languages and literatures, these 18 chapters draw a various yet consistent picture of the literary exploitation of the imagery, concepts and symbolism of ancient textiles and clothing. Topics include refreshing readings of tragic instances of deadly peploi and fatal fabrics situate them within a Near Eastern tradition of curse as garment, explore female agency in the narrative of their production, and argue for broader symbolic implications of textile-making within the sphere of natural wealth The concepts and technological principles of ancient weaving emerge as cognitive patterns that, by means of analogy rather than metaphor, are reflected in early Greek mathematic and logical thinking, and in archaic poetics. The significance of weaving technology in early philosophical conceptions of cosmic order is revived by Lucretius’ account of atomic compound structure, where he makes extensive use of textile imagery, whilst clothing imagery is at the centre of the sustained intertextual strategy built by Statius in his epic poem, where recurrent cloaks activate a multi-layered poetic memory.